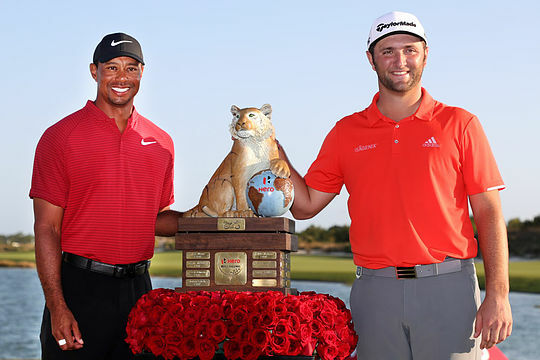 (Albany, Bahamas:) Jon Rahm admitted a putting tip from tournament host, Tiger Woods helped in storming his way to a four-shot success in the Hero World Challenge. Rahm, 24, was never challenged over the final round in shooting a bogey-free 65 for a 20-under par tally on the Albany course. The win is Rahm’s third success this season and a seventh victory in his short two-year pro career. The victory sees Rahm move to a career high of No. 6 in the World Rankings. Rahm had shared the lead on both day two and day three and capped his closing round with three birdies in four holes from the sixth while his 25 birdies over the four round translates into a $6,250 donation to the ‘California Wildfire Appeal’. In September, Rahm was first overawed to be drawn in the Ryder Cup Sunday Singles against boyhood idol Woods and he delivered Europe their much-needed first point with what was a very emotional 2&1 triumph over Woods. Now two months later Rahm has his name on Woods’ Hero World Challenge trophy. “That Sunday with Tiger is one of the most emotional, most important moments in my golf career,” said Rahm. And it was putting tip last August on the practice green at East Lake Golf, just ahead of Woods capturing an 80th PGA Tour victory, that helped him become the first Spanish winner of the Hero World Challenge. “When we were at East Lake, Tiger was putting next to me and I asked him, and because I am not the best putter on Bermuda grass, that I just can’t putt on Bermuda as I had grown-up in Spain on Poanna,” said Rahm. “I did say to him, ‘My man you should look at my stats as it’s all to do with ball-striking’”. American Tony Finau holed a dramatic 15-footer for birdie at the last in a score of 69 for second place at 16-under and in the process denying local resident Justin Rose from returning to World No. 1. Rose, who eagled 15 in a last round 65 had been sharing second place in 15-under par and the assurance of again becoming World No. 1 only for Finau to put that rug out from under the Englishman. “It’s not a huge goal for me to be No. 1, but when you have these opportunities you want to take them,” said Rose. The only Australian in the field, Jason Day, finished in 16th place four shots ahead of Woods at 5-under.